We’re sure you’ve seen bubble around. The cold, frothy, colorful tea drink with boba (or tapioca) balls sitting at the bottom? It’s all the rage right now and it’s absolutely delicious. There are plenty of cafes and tea houses across Massachusetts serving up flavors ranging from coconut to Japanese green tea. This delicious drink is the ultimate refresher. Here are the 10 best places for bubble tea in the state! When you visit Kung Fu Tea, you really must check out their winter melon milk green bubble tea. It’s refreshing and delicious, and those bubbles add the perfect little extra in a tasty, filling cold drink. Check out the bubble tea at Yoway Café & Frozen Yogurt. The chai bubble tea is a favorite among the college students who frequent the store. Try a mango, coconut or strawberry bubble tea at ExtraSpecialTeas. Choose from coconut, almond or whole milk for the utmost in creamy flavor. Several kinds of bubble tea grace the menu at Tea-Do. Choose from Japanese green tea, Thai milk, strawberry milk, and more. Grab a bite to eat while you’re there. The fish balls are amazing! If you’re craving bubble tea—and maybe want to grab a breakfast sandwich or quick lunch, check out Cha Shu Coffee & Bubble Tea. Steps away from the T, it’s the perfect spot to hang out before continuing on your way to or from work or school. Check out the impressive bubble tea creations at Boston Tea Stop. Regulars claim they have more than anyone else around. In addition, they serve exceptional smoothies and regular hot cups of tea. 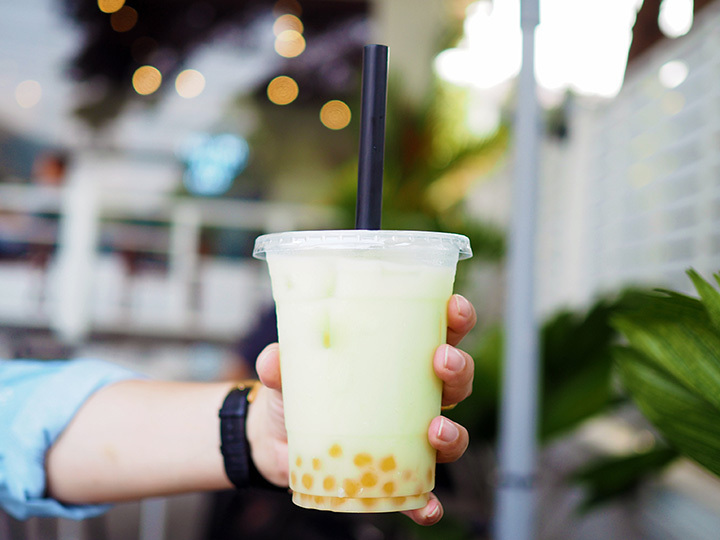 An incredibly popular bubble tea spot, LimeRed Teahouse uses nothing but real ingredients and fresh local milk in all the bubble tea they serve. Check out their espresso bar and dessert bar while you’re there, too. Find locations in Amherst, Boston, and Northampton. The peach milk bubble tea at FunTea Café is a favorite among the café’s regulars. Open for a few years now, they frequently add new flavors. If you’ve never tried bubble tea, this just might be the place to do so. Buy one bubble tea, and get one free during Happy Hour at TeaMoji. This is the perfect way to introduce a friend or family member to the rich, creamy delight that is bubble tea. Featuring counter service only, Monkey King Tea is known for their delicious bubble tea. The exceptional staff—and free Wi-Fi—makes it a great place to visit. Their menu of snacks features some tasty options, too.